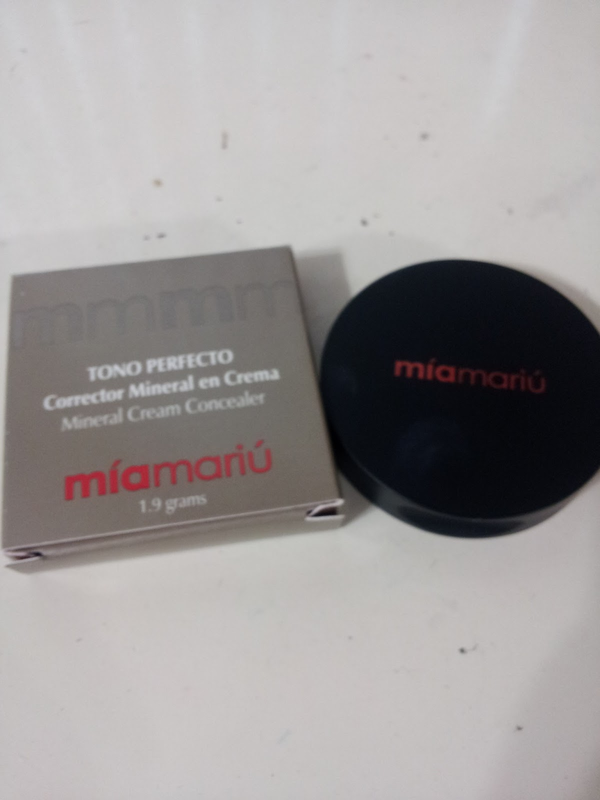 I’ve never heard of the company Mai Mariu before they contacted me about reviewing a few of their makeup products on my blog. I was thrilled at the opportunity, and eagerly selected three items to be sent to me to review. 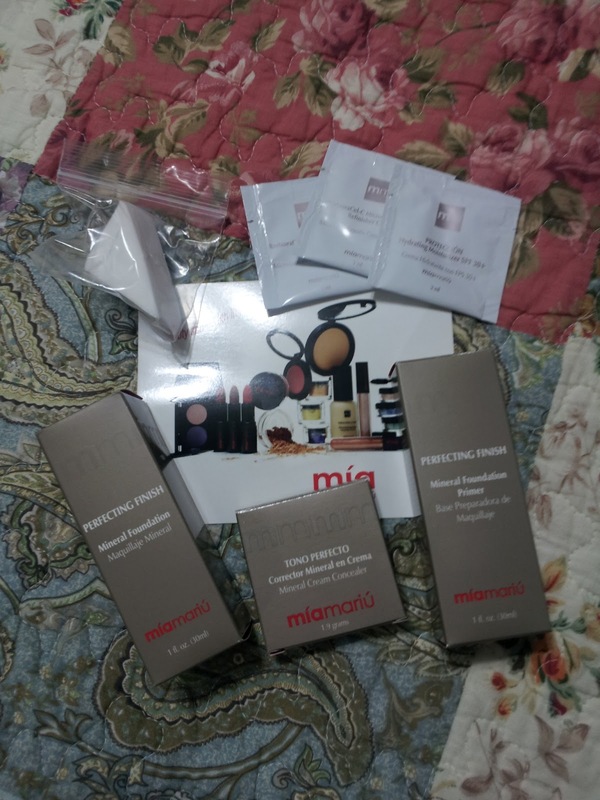 And as you can see from the picture on the left, they also sent a few samples from Mia Mariu‘s skin care line and a sponge for applying foundation. It was quite a fun and exciting package to open up! First off, every good foundation application needs a good primer to prep the skin for a long-lasting and even-toned application of foundation. I have been on the hunt for a good primer (tried ELF’s primer, and didn’t like it very much) so was eager to give Mai Mariu‘s primer a try. And I really, really like it! It does on a wet-liquid consistency but in just a few minutes it dries to a very matte and smooth finish — just perfect for applying foundation over. I’ve also noticed how it helps control the oils in my skin from seeping through my foundation. I have really oily skin, so any product that can do this, is wonderful! 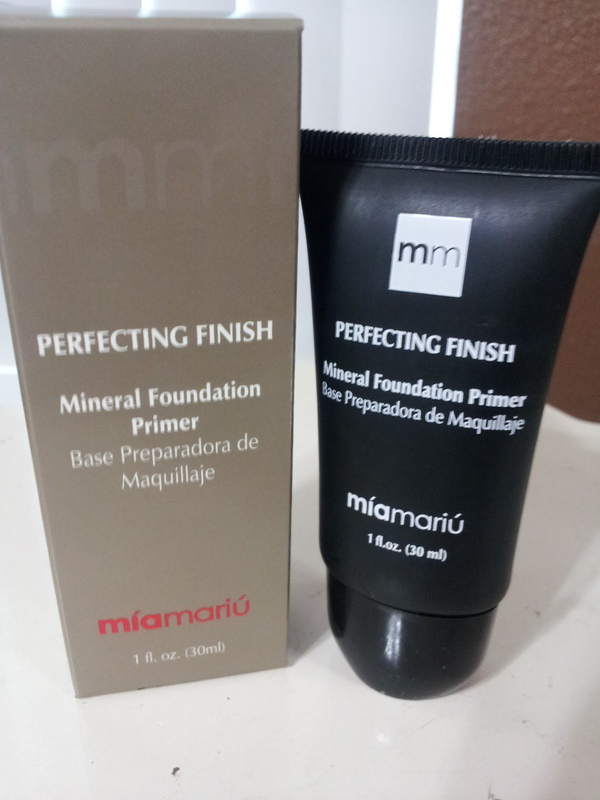 I’ve been using the Perfecting Finish Mineral Foundation Primer almost on a daily basis and thinks it works wonders! I highly recommend this product! On to the foundation! I liked the feel of this foundation. It’s a bit of a liquidy foundation—in that it’s not a mousse kind of liquid foundation. It went on really well and, as I said, had a good feel to it. I was a bit disappointed in the lasting power that this had. I would apply it in the morning, and then by noon-ish I felt like my face started getting “splotchy”….as if the foundation was melting off some portions of my face and grouping up in others to give a very splotchy, cakey look to my face. So while I cannot recommend this product for long wearing, I would be willing to say it’s a nice foundation for short occasions. But not one I would recommend to go all day in. Especially if you will be sweating I wasn’t even doing anything strenuous when I wore this, but just the natural oils in my skin really showed through and, as I said, gave me a splotchy look. Another plus to this foundation is that it’s mineral. For that reason alone I really wished I had gotten his foundation in my color so I could wear it. I really would prefer to wear makeup that is good for my skin and doesn’t tend to clog my pores. 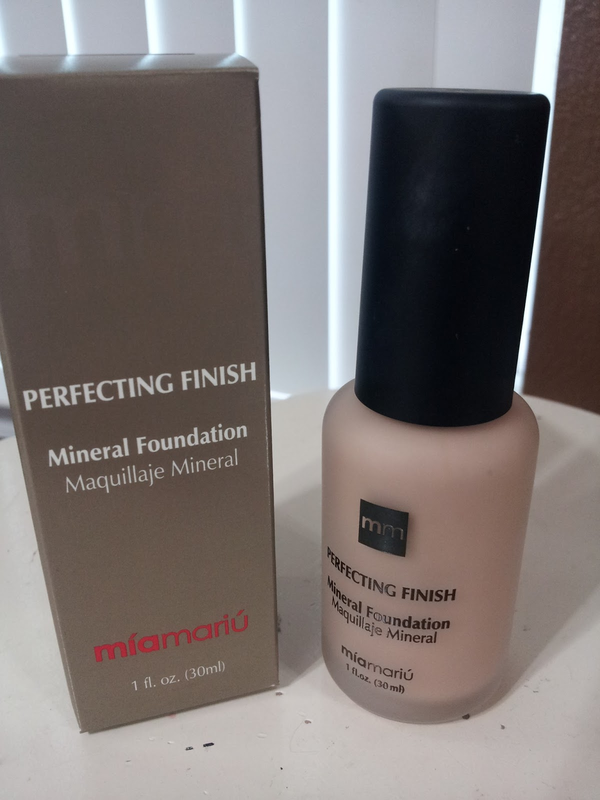 If you are the type who is careful of what you use on your face, I would recommend looking into Mia Mariu‘s Perfecting Finish Mineral Foundation. Last, but not least, is the concealer! This was also too dark, but it actually wasn’t that bad, and I use it on a daily basis when applying makeup and have acne to cover up. I just have to be careful not to use too much and cause a dark spot on my face. But it works very well at concealing the redness of my acne. It has a sticky consistency which comes in handy when you set your concealer—the powder sticks right to it and it doesn’t move…for a while. Like the foundation, the concealer didn’t have a very long-lasting hold. It tended to wear as the day goes on. Though not as quickly as the foundation did, I was happy to see. I will definitely be using this Perfecting Finish Mineral Cream Concealer until the last bit of it has disappeared from the container! Well, there you have it, my thoughts on Mia Mariu‘s line of face products. I think the quality of these products is pretty good (besides the foundation not being as long-lasting as you would think, for the price). I would definitely recommend you look into this line of makeup—especially the primer! So, you ready for your chance to win one of these products? Yep, Mia Mariu has instructed me to run a giveaway on my blog and the winner of the giveaway will get to pick one of the products that I reviewed. So, if you won, you’d have to decide if you’d want the primer, foundation, or concealer. (And, of course, you would select your shade before the gift was sent to you!). Don’t miss out on this great opportunity for free makeup—sign up in the Rafflecopter below. Giveaway ends midnight on March 5th. I would love to try the primer! I have a foundation, but a good primer would be nice. I think I could use foundation the most. I would pick the foundation! I would choose foundations. I have really been wanting to try this company and what a perfect way to try! Thanks for the contest! !